Mozilla already announced plans earlier in the year to offer a Modern UI (formerly known as Metro) version of its popular browser, but now new details are beginning to emerge, including a few carefully placed screenshots like the one above. Brian R. Bondy, a developer working on the project, posted an update to his blog outlining Mozilla’s progress and goals for the fall release. “Work on the Metro style enabled desktop browser has progressed steadily and things are looking really good,” Bondy writes. According to Bondy, a preview version of Firefox will be available first as a beta release, planned for later in the year. The preview will be styled as a “combined classic + metro browser” with classic desktop user interface elements for tabbed browsing and navigation. The Mozilla team still has a lot of work to do before beta release, but a few features have already been successfully implemented. Some are of little interest to the average user, referring to programmer-specific details. But others like a built-in PDF viewer (no need for a plug-in), an option to view a page on the desktop when in the Metro version, windowless Flash, and auto-populated search results below the URL bar are all promising. Add-ons will not be included in the initial release when in Metro-mode — much like IE’s Metro browser — but Mozilla hopes to enable them eventually. Syncing between the desktop and Metro versions of the browser is also in development. Bondy hopes to find some sort of local sync functionality requiring zero set-up, but says he and the rest of the team can always default to the current syncing solution if needed. 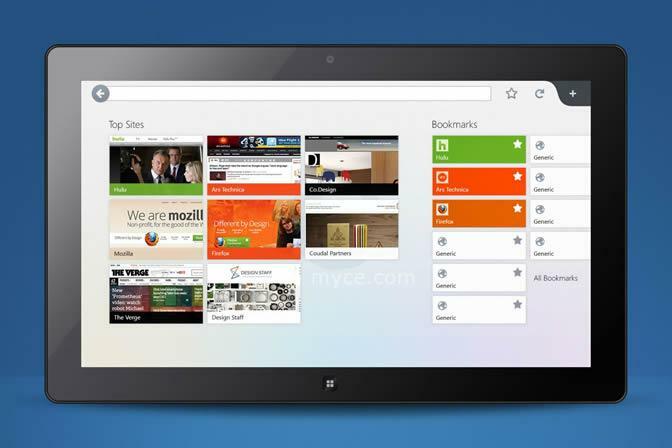 Based on some screenshots posted by developers working on the project, Firefox for Windows 8 will borrow a little inspiration from its Android version with a sprinkling of Modern UI on top. The simple URL bar at the top of screen makes the design look neat and clean, though it’s oddly located at the top rather than the bottom — Microsoft’s preferred position. The tiled bookmarks are a welcome addition as well, an improvement over the traditional drop-down menu. Google may have beat Mozilla to the punch on Windows 8 with a Chrome dev release tailored to the Modern UI design, but from what we’ve seen and read so far, it seems Firefox will do a much better job of competing with Internet Explorer’s tiled interface than Chrome, which basically ported its desktop design to Windows 8.